Welcome to Ace Auto Inc. 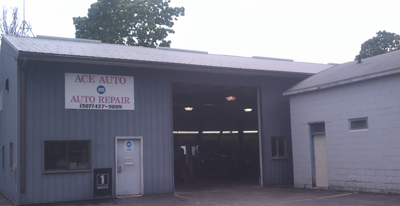 Ace Auto Inc. Offers Auto Repair Services You Can Count On! Since 1998, Ace Auto Inc. has provided motorists in the Winona, MN 55987 area with comprehensive auto repair services that include 4x4 Services, Alignment, Brakes, Car & Truck Care, Domestic Cars & Trucks, Electrical Services, Electronic Services, Engine & Transmission, Engine Maintenance, General Services, Heating and Cooling Services, Import Cars & Trucks, Miscellaneous Services, Tires, Towing, Transmission Services and Undercar Services. Our goal is to offer the best services available at affordable prices to get you back on the road in no time. For a high-performing vehicle, trust Ace Auto Inc. with your car, truck, or van. To learn more about the services we offer, please contact us by phone at 507-457-9809 or send us an email. We also invite you to learn more about our dedication to you, our valued customer. The best at diagnostics around, which saves time & money. They're right the first time every time. Fair prices, honest people. Great customer service and price. Took a little longer than expected but I have definitely found a new repair shop that I can trust. Play it safe, take it to Ace! It will take a few days to get an appointment for repairs, but the price and quality of work are absolutely worth the wait. Remember: good, cheap, fast: pick two. Well, you're getting good and cheap here. Brought in my Ranger for some new wheel bearings a couple months back, and received great, friendly service, along with the lowest price in Winona. Will use this shop again. Always super friendly service. Being a woman going to get your car fixed always ends up being alot of extra "costs" to try to get more money out of you, and I've never had this experience at Ace. They are always super up front with me and only replace things that actually need to be replaced. I won't go anywhere else to get my vehicle looked at or fixed. Absolutely recommend this shop. Was stranded in town when my alternator went out and an Ace mechanic stayed late to finish replacing it so I could get home. Clearly incredible customer service and very reasonable prices. I would definitely recommend! Fair prices and honest people, I recommend everyone deal with them. Great prices and top end mechanics, would trust them to fix any vehicle I have. Very satisfied. Great prices! ($150 less than what a dealership was quoting) Wonderful customer service as well.